Have you ever been able to picture yourself building your own Ramen empire in your very own kitchen? You should, because you can. 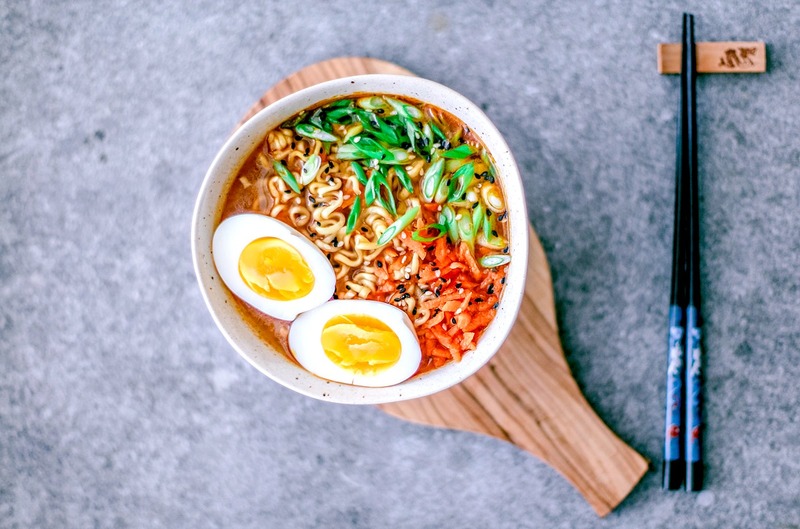 The flavor profile of true Ramen broths can be beautifully complex with sweet, spicy, and savory notes dancing along your tastebuds with subtle hints of fish. But if you’re just at home, feeling lazy, and hankering something that tastes like a Ramen bowl, looks like a Ramen bowl, and warms your belly like a Ramen bowl, there’s no need to fuss. You can get it done, and with minimal ingredients that you probably already have kickin’ around in your pantry. Also! If you have a local Asian market, check them out. Because your pantry item options can easily expand out to things like shimeji mushrooms and naruto—you know, those pretty white and pink-spiraled fish cakes. I have some in my freezer right now. All you *really* need is garlic, ginger, sesame oil, olive oil, vegetable broth (you can use chicken broth, if you’re not pesce/veg), a packet of Ramen noodles, Sriracha or sambal for some heat, and veggies for nutrition. I like to add shredded carrots, sliced scallions, and if I have them, shiitake mushrooms. Oh, and obviously a soft-boiled egg, which is basically the best part; it’s the cherry on the Ramen sundae. I typically keep my bowls veg-based. It’s the easy thing to do, and this bowl of goodness is all about feeding yourself while lazy. But adding a protein is always good, especially if you have leftovers in the fridge that you need to use up. Tofu, sustainable shrimp—or again, if you’re omnivorous—chicken or pork. You do you, babe. If you love Ramen and are eager to make it at home often, you have to try this Spicy Shoyu Ramen and this Miso Ramen! Make homemade Ramen in the comfort of your own kitchen with minimal and simple ingredients. Heat sesame oil and olive oil in a medium-large saucepan over moderate (see notes). Add garlic and ginger, and simmer until fragrant, about 2-3 minutes. Do not brown the garlic, or else you'll get a bitter flavor. Add the carrots and mushrooms if you're using them, and simmer until they soften, about a minute, stirring frequently. Add the broth, Sriracha sauce, rice vinegar (if using), and soy sauce. Stir, and bring to a simmer; let it go for about five minutes. Taste, and adjust heat and taste to your liking by adding more Sriracha and soy sauce if needed. Carefully place the Ramen noodles into the pot of simmering broth and allow to cook for approx. 2-3 minutes, or until cooked and tender. Carefully transfer the soup and noodles to bowls, and allow to cool. At this time, make your soft-boiled egg. Bring water to a boil in a small saucepan. Add the egg(s), and let them boil for five minutes. In the meantime, prepare an ice bath in a bowl. Once five minutes are up, remove the egg(s) and dunk them into the ice bath for about a minute to cool them off enough to handle. Then, lightly crack and roll them on a flat surface, peel, slice in half, and place on top of your Ramen. Garnish with your toppings of choice. Fall into a state of bliss. *In case you were wondering why I use the two oils, it's because using just sesame oil can bring a bit too much of a potent sesame taste to your broth, depending on what you're using. But it's nice to have that hint, so I decided to mix the two. You can definitely use one or the other if you prefer. I made this ramen bowl one time about a year ago and ever since then my wife has asked me about once a month to make "my" ramen because it's so good. Today we had some thinly sliced radishes and zoodles and it was fantastic. Thanks so much for this awesome recipe! Making tonight for the second time per teenager request after the last time. Thank you! It's fun and easy. I suggest steamed or pan-fried dumplings on the side for families of starving males like mine :). Fantastic base recipe, and easily adaptable for varying veggies on hand! Thanks for this quick and delicious recipe! We made it last night and everyone loved it. We added some chicken breast tenders (baked in the oven and cut into small pieces) and some baby bok choy (white sections chopped into bite-sized pieces and added to the simmering soup to soften, and leafy greens added to the pot at the table). We also roasted the mushrooms at very high heat in the oven, because we like that little bit of crispy texture they pick up this way! We will definitely be making this in the future. Thanks again! I’m horrible at following recipes, always scared of things I don’t normally eat BUT this was AMAZING!! Sooo flavorful, easy to do and add anything to it! Thanks so much for sharing!!! Marie! This makes me so happy. I'm so glad you enjoyed this recipe. Thank you so much for taking the time to stop in with feedback :) Hope many more bowls keep you cozy for the rest of the winter! This is the perfect ramen recipe! We make this probably once a week since we discovered this. We really like noodles so we add an extra package of ramen and typically add a few more veggies depending on what is in the house. Thanks for posting!! How [raw or cooked) would I add tofu & when, can I use dry shiitake mushrooms? It depends on how you like your tofu. Technically tofu doesn't need to be cooked, but you want it to soak up flavors and have a bit of texture otherwise it will taste very bland. I'd add tofu in at the beginning and let it simmer with the garlic and ginger to pick up some flavor. You could also cook it separately and make crispy tofu (here's my go-to method: https://www.killingthyme.net/vegetarianism/how-to-cook-crispy-tofu/) and add it to the soup upon serving. I've never used dried shiitake, only fresh. I think with dry, you have to soak them for about 20 minutes to bring them back to life (check the instructions on the packaging), and then you can add them as you would fresh mushrooms. Hope this helps! It helps greatly! Thank you so much for your helpful response. That sounds amazing, Aaron. So glad you enjoyed it! I'd love to know where you got these bowls! My family has fallen in love with ramen bowls and I need more than the usual cereal bowls! Hey Tanya! I snagged these bad boys from Amazon. They have a decent selection on there! Ramen just tastes so much better out of a proper (massive) Ramen bowl :) Hope you find something you like! I LOVE this recipe and have made it multiple times! I'm thinking of mixing up a paste with some of the ingredients and keeping it in the fridge for easier prep. Thanks so much for the feedback, Diane! I love that you're so into it. Let me know how the paste goes if you come up with one, that's a great idea! This was a big hit for dinner tonight! I added chicken and broccoli. It's a keeper for my recipe pins! Can you use other noodles found in the Asian section if the grocery store? Hey Julie, absolutely. I often use soba noodles, and recently used vermicelli. Just check the cooking instructions on the package and go as directed. My hubby loves ramen, we definitely need to try it at home! This looks so delicious, yum! Thanks, Kim! I hope you both love it. Keep me posted! It's funny, if I go to make this and realize I don't have scallions, I don't make it. I can't. They truly complete the dish for me. I've been intimidated to make my own ramen at home but now I'm thinking I might have to try it!!! It looks SO GOOD! Yum! This sounds perfect for the cold weather we have been having. Such wonderful flavors! Can you believe I have never been to a ramen bar!? Insane, I know! But now I confess I'd rather just make it at home, this looks so delicious!! Your pictures are absolutely gorgeous, as well - as usual! Did the recipe change? My husband requests this fairly often and cooking it felt very different this time. I feel like I was missing mushrooms and rice vinegar. Also didn’t there used to be more soy sauce? Hi Whitney! I did just alter the recipe to be a bit more "pantry staple" friendly and have less sodium. The previous version would have had you adding shiitake mushrooms with the carrots, prior to adding the broth. You can still add a TBSP of rice vinegar! I found that a lot of family/friends would ask if it was necessary, since they didn't often have it on hand. It's an option. And as for the soy sauce, it used to call for 1/4 cup. I use just less than that now, but if that's your preference, by all means! Hope this helps. I have come back to this recipe numerous times. The flavors come together to make such a great broth! Thank you for sharing. This recipe has taken the place of regular chicken noodle soup in our house. I thought it was mazeman at first but then I noticed the soup. It looks super savory and tasty. Thanks, Annie! Savory is a great way to describe it. I can definitely see how it could resemble mazeman, too. The broth is covered by all of that goodness.